I don’t want to make this long. It’s just been a while since I last posted my writing achievements and goals on my website. Plus, one of the things I like to focus on this new year is my blog–and I felt this was a good first step. So, I listed below two goals I completed in 2017 and two goals I have for 2018 to share. Read 24 Books: Between all the non-fiction reference books, fiction novels, and manga, I was able to read 31 books this year. Though I no longer review or accept review requests, I still try to keep up with the reading. Published my 4th Book: Yesterday was the official release day of Death Island, my new adult adventure. I’m really proud of this since this was the novel I started back in high school, then had agented in graduate school, and rewrote based on publisher feedback for the past two years. Writing: I’ll be mainly focusing on Dark Reflections this year, writing at least 1 page a day. Also, I’m hoping to start either my new adult sci-fi, Radioactive, or my novella, Bly House. Blogging: I don’t get much time to blog anymore, but I want to commit to a research post once every quarter this year. I still like to try to help authors with promoting their work through a few blog tours and cover reveals. Anything additional will be icing on the cake. How about you? What did you finish in 2017? What are your 2018 goals? Congrats on the release of Death Island! Hope you have a wonderful new year! 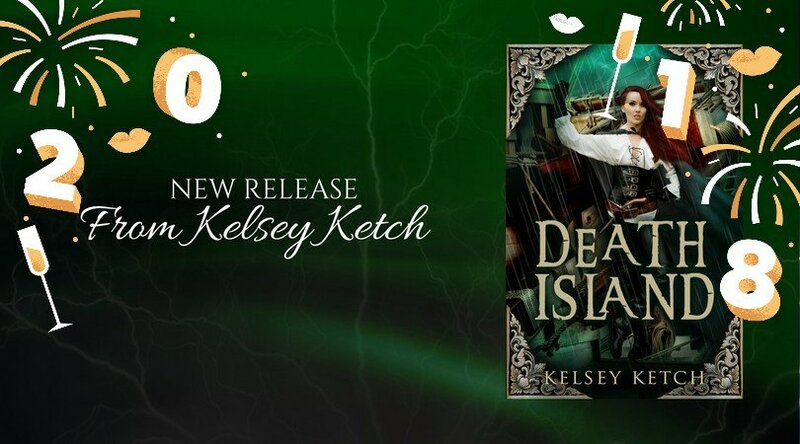 Wonderful news about your new release, Kelsey! Death Island has been in your head so long that it must be a thrill to launch it to the world. 31 books is a great reading pace. I don’t really have many concrete writer goals for 2018 other than just having fun creating! Happy New Year.